Members of the public age 18 and older requiring dental cleanings may qualify for free treatment! Participants will be involved in the clinical portion of the Western Regional Examining Board (WREB) examination. 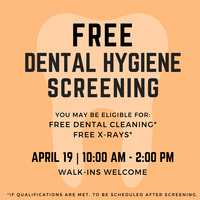 Dental hygiene students at University of the Pacific, Arthur A. Dugoni School of Dentistry will hold screenings to select potential patients at 155 Fifth Street in San Francisco, CA. No appointment is necessary, and patients will be screened on a first-come, first-served basis. There is no charge for the screening. Please note: no treatment will be done at the screening appointment. For the screenings, patients should arrive at the dental clinic entrance at the corner of Fifth Street and Minna Street. The school is located 1.5 blocks from the Powell Street BART/Muni Station and paid parking is available at the Fifth and Mission Parking garage next to the school. The WREB exam provides standardized clinical assessment to help state boards make decisions in issuing licenses, and our graduating dental students take the exam each year. As part of the exam, students must demonstrate certain treatment techniques and are required to provide their own patients. If chosen to participate in the WREB exam, a patient will receive free treatment.